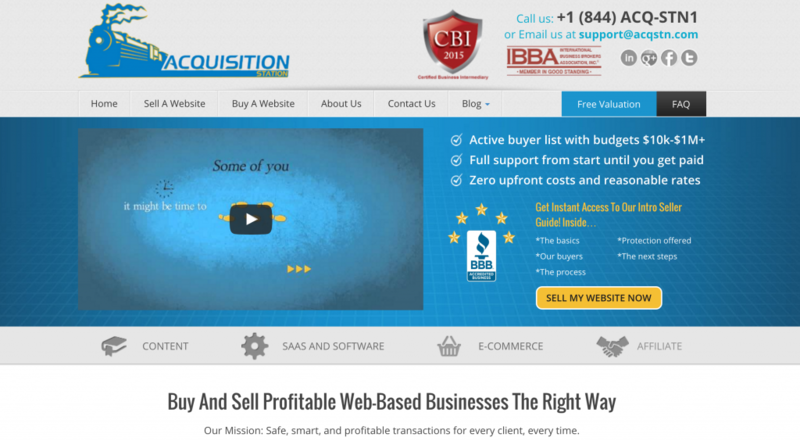 Acquisition Station is one of younger brokerages, established and operated by Ryan Rorensen – former Senior Broker of FE International. Established in late 2014, Acquisition Station has grown quicker than most other newcomers, but only appears to have sold 13 listings, majority in the sub-$100k price range, in its first year in operation. Valuations tend to vary significantly, but appear to be mostly reasonable, indicating that the broker takes an active part in valuing businesses for sale and actively refuses sellers with overly high price expectations. Whilst the owner and broker of Acquisition Station is certainly capable of performing due diligence and spotting fraud and low-quality assets, as with most young brokerages, acceptance criteria appears to be rather relaxed. Acquisition Station’s marketing materials appear to be of fairly decent quality, featuring all of the information expected by most buyers, as well as a thorough Seller Interview. Acquisition Station is ran solely by Ryan Sorensen and the only other staff member appears to be a marketing employee. As such, one needs to account with the risk that should the broker become unavailable for whatever reason, there’s likely no-one else to take over a transaction and see it through. The reviewer has no reason to doubt in Acquisition Station’s or Ryan Sorensen’s integrity, however some complaints over unlawful solicitation have been communicated from external sources. Note that the reviewer has not verified such complaints. As a young brokerage, inventory is very limited with a maximum 5 properties listed at most times. Turnaround times are relatively slow, more so for properties in the $100,000+ price range.